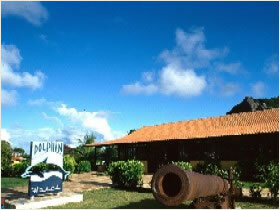 The Dolphin Hotel is considered to be a very comfortable hotel and has the best infrastructure among the accommodations on the island. It is located on the central part of the island and is next to the beaches of Boldro, Americano, Bode, Cacimba do Padre Caieira and Conceicao. The Hotel Dolphin has 11 rooms, all equipped with TV, air conditioning, private bathroom with hot water, telephone, and mini-bar. The restaurant is specialized in seafood, but also offer local and internationl dishes. Leisure facilities are a vapor sauna, swimming pool, jacuzzi with hyrdromassage. Furthermore facilities are a living room with cable TV & Video, DVD player with shows, games room and a bar.